Part 3 of my 8th edition Genestealer Cults codex review will take a look at the Warlord Traits, Relics and Psychic powers available to the army. 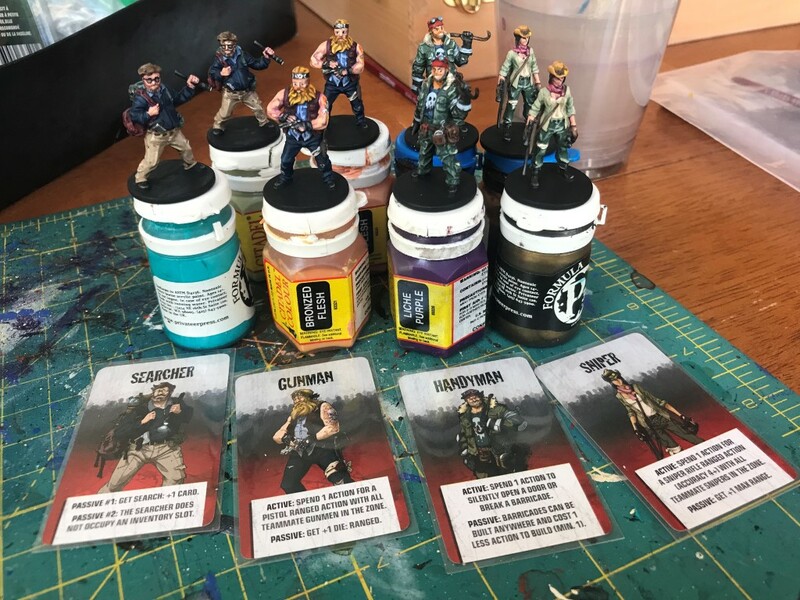 Check out the previous parts of the review if you missed them; part 1 looking at the generic army special rules, while part 2 looked at the new Stratagems. 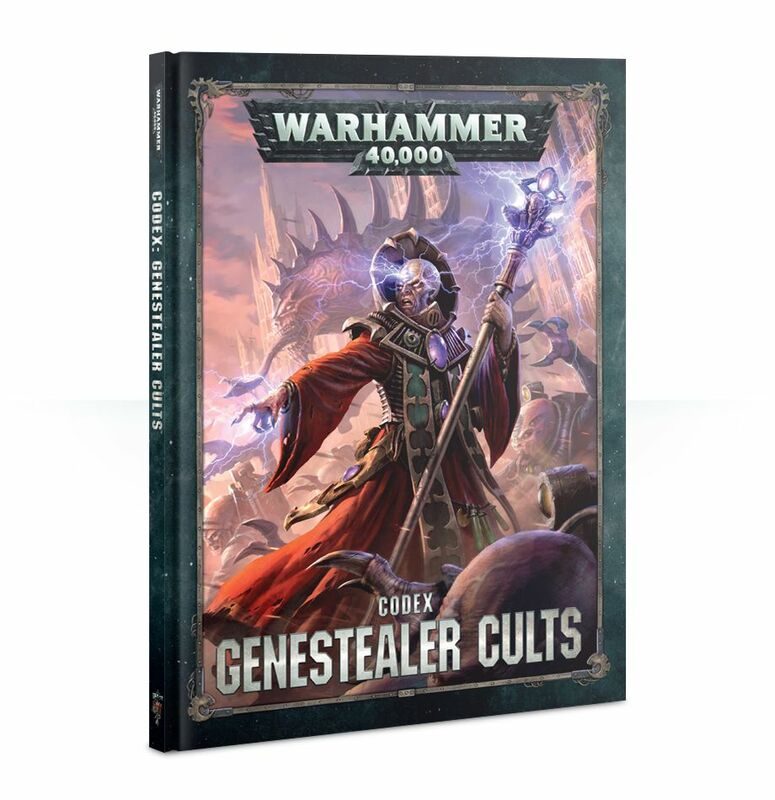 The Genestealer Cults get 6 new generic warlord traits, as well as the Creed-specific ones. 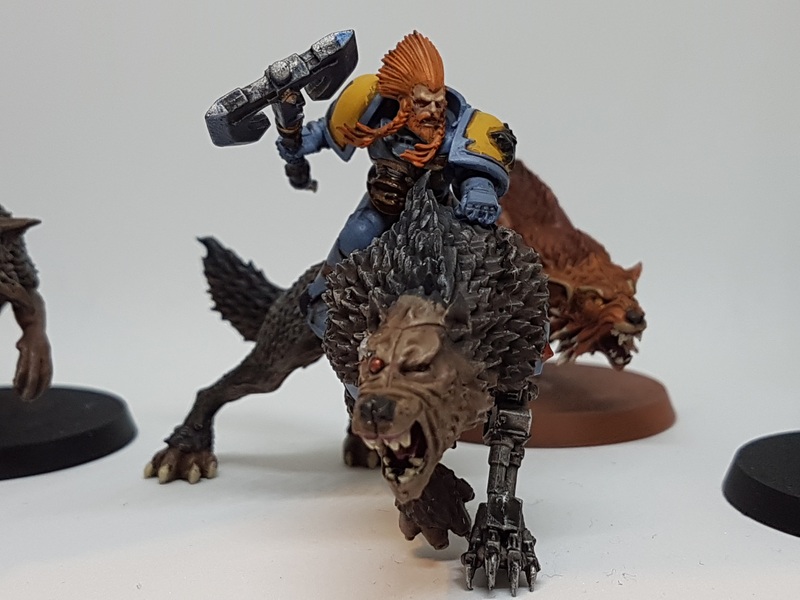 Focus of Adoration- Friendly Cult Infantry and Biker units can perform a heroic intervention whilst they are within 6" of your warlord, even if they are not characters. This was the one from Chapter Approved. It is ok, but I rarely found myself in a situation where it would come into effect. I would probably give it a miss. Shadow Stalker- Subtract 1 from hit rolls for attacks that target your warlord. A solid warlord trait. Will help out a Patriarch in combat against enemy shooting attacks. A great one for a Jackal Alphus, making it -2 to hit in the shooting phase. Biomorph Adaptation- Add 1 to your warlord's attacks and strength characteristics. Another nice bonus for a Patriarch, giving him 7 attacks at S7. Just a pity the patriarch doesn't get the Creed bonuses, as he would go up to S8 with Twisted Helix! Works well for a Primus, going up to S5 or S6 with the Twisted Helix creed. Born Survivor- Reduce any damage inflicted on your warlord by 1 (to a minimum of 1). Another nice bonus for keeping your warlord alive for longer. Good for attacks that get through the Unquestioning Loyalty save. Alien Majesty- Add 3" to the range of your warlord's aura abilities. I think this is a very strong warlord trait. This gives you a 9" bubble of +1 to hit in the fight phase with a Primus, or a 9" immunity to morale bubble with a Patriarch. I think this also increases the range of the Unquestioning Loyalty ability to 6", so gives you more chance of keeping your warlord alive for longer. Preternatural Speed- Your warlord always fights first in the Fight phase, even if they did not charge. If the enemy has units that charged or has a similar ability, then alternative choosing units to fight with. A nice bonus for a combat character. However, if you are getting charged, you are not going to be able to use it in most cases. Inscrutable Cunning- Cult of the Four-armed Emperor only. Once per battle if your warlord is alive, you can re-roll one hit roll, wound roll or saving throw made for a friendly unit. In addition, if your army is battle-forged, you gain D3 command points before the battle begins. A nice bonus, and a chance of getting up to 3 extra command points for the game. I think this is a solid warlord trait, but possibly not the most powerful. Hivelord- Hivecult only. Re-roll hit rolls of 1 for attacks made with ranged weapons by friendly Hivecult units that are within 6" of the warlord. A nice bonus for a backfield Genestealer Cults warlord. Unfortunately, it doesn't work on units you would want to use it on such as Cult Leman Russ or Heavy Weapons Teams. Entropic Touch- Rusted Claw only. Each time you make an unmodified wound roll of 6 in the Fight phase for a model within 6" of your warlord, the AP of the attacked is improved by 1. A solid bonus for units in combat, giving you the chance of going up to AP-2 with your Rending Claw attacks on an Acolyte Hybrid unit. Beloved Grandsire- Pauper Princes only. Add 2 to Unquestioning Loyalty rolls made when you fail saving throws for your warlord, or when your warlord suffers mortal wounds. This is pretty solid, allowing you to pass off wounds on a 2+ to nearby Genestealer Cults units. This should help keep your warlord alive for even longer. Bio-Alchemist- Twisted Helix only. Increase the damage characteristic of weapons (other than Relics) used by the warlord by 1. A nice bonus for the Patriarch, making its Monstrous Rending Claws very potent in combat. Overall, some nice warlord traits available for the Genestealer Cults. The initial stand outs for me are the Alien Majesty, Biomorph Adaptation and Inscrutable Cunning, for the additional command points. I can see uses for most of them, but there are none that seem like immediate choices for me. The Genestealer Cults also have access to a wide range of Relics to take with the army. Icon of the Cult Ascendant- Acolyte Iconward only. Add 1 to the strength characteristic of friendly Cult Infantry and Bike units within 6" of the bearer. This is the relic from Chapter Approved. I found it to be a solid addition to the army. Very useful when combined with the Twisted Helix creed, taking your Neophyte hybrids up to S5 and the Acolyte Hybrids up to S6 when in range of the Iconward. Sword of the Void's Eye- A bonesword that is +2S, -3AP and D3 damage, that allows you to re-roll hit and wound rolls for the weapon. A solid Relic for the Primus. This takes him up to S6 and gives him some strong punch in combat. Note, this says re-roll to hit rolls, not failed to hit rolls, so you get more options to re-roll if you are against an opponent that gives minuses to hit in the Fight phase. Amulet of the Voidwyrm- Add 1 to saving throws made for the bearer against ranged weapons. In addition, enemy units cannot fire overwatch at the bearer. This is a nice bonus for a character. The save bonus is decent, but most characters have pretty poor armour anyway. I think avoiding overwatch is more of a bonus, allowing you to get your bigger units into combat unharmed. It also doesn't specify armour saves only (yet), so may give your Patriarch a 4+ invulnerable save against enemy firepower. Scourge of the Distant Stars- Add 1 to hit rolls made with the bearer's melee weapons. In addition, each time an enemy model targets the bearer with a melee weapon and your opponent rolls an unmodified hit roll of 1, the attacker's unit suffers 1 mortal wound after all its attacks have been resolved. Not the most useful relic for a Patriarch or Primus, as they get +1 to hit anyway. Could be useful for the Abominant, allowing him to hit on a 3+ again. The chance of the enemy unit doing damage to themselves is a nice bonus. Oppressor's Bane- An Autopistol or liberator autostub that is Pistol 3, S4, AP-2, 2 damage, that can target characters, even if they are not the closest. You can re-roll wound rolls for attacks that target characters. This is ok. Could be useful on the Kelermorph to do a bit more damage and have a higher AP on one of its pistols. I would probably give this one a miss. Dagger of Swift Sacrifice- A Cultist Knife that is strength user, AP-2 and 2 damage. The bearer can make one additional attack with the weapon, and it always wounds on a 2+ unless targeting a vehicle or titanic unit. If a character loses any wounds, but is not slain, it suffers D3 mortal wounds. A nice bonus for going after enemy characters, and useful on a Character that can do well in combat. Only really useful in a Sanctus, but the only additional bonus it gets is the chance of doing D3 mortal wounds. I would probably avoid this one too. The Crouchling- Patriarch or Magus with Familiar only. Follows the normal rules for a Familiar. In addition, while the Crouchling is alive, the Patriarch or Magus knows one additional power from the Broodmind discipline and adds 1 to any psychic test it takes when attempting to manifest a power from the Broodmind discipline. A nice bonus for the Patriarch or Magus. This means they get three powers from the Broodmind discipline, but can still only cast one per turn unless they use the Familiars. Once you use up the Crouchling, you wont get the bonus any more, so there is an incentive to not use it. The Gift From Beyond- Model with a Jackal or Silencer Sniper Rifle only. Add 2 to wound rolls made with this weapon, unless it is targeting a Vehicle or Titanic unit. This is a pretty solid relic to take if you are using one of the Sniper characters in the army. This means that you will be wounding most Infantry characters (T4 or less) on a 2+, and doing a mortal wound to them on a 4+. This is a pretty solid option for taking on enemy characters, but if they have a good armour save or invulnerable save, you may not get the shot through their save. 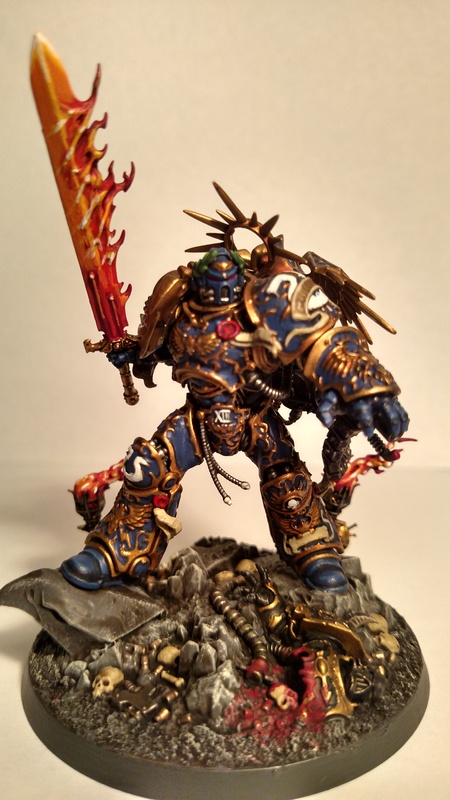 Sword of the Four-Armed Emperor- A Cult of the Four-Armed Emperor Bonesword. This is strength user, AP-3 and 1 damage, and allows the bearer to make four additional attacks. Pretty solid on a Primus, giving it 8 attacks that hit on a 2+ at S4 and AP-3. Great at going through standard infantry models. I think this is a solid choice of relic and one that I would run often on a Primus. Vockor's Talisman- Hivecult only. You can re-roll hit rolls for attacks made with the bearer's melee weapon when targeting enemy characters. In addition, each time you roll a wound roll of 6+ for an attack, the attack inflicts one mortal wound on the target in addition to any normal damage, as long as it is not targeting a Vehicle or Titanic unit. A decent bonus for any of the Assassin-type characters in the army, to allow them to do extra damage in close combat. Not one I'm sure I'd take that often. 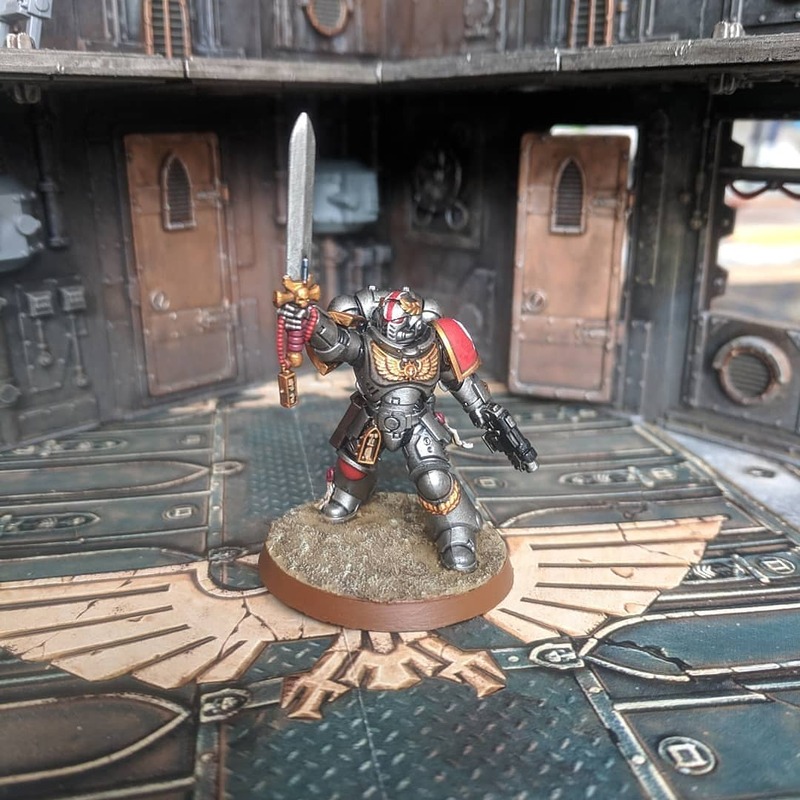 Mark of the Clawed Omnissiah- Bladed Cog only. The bearer has a 4+ invulnerable save. In addition, each time this model finishes a charge move, select one enemy unit within 1" of it and roll a D6. On a 2+, the unit suffers one mortal wound. This is a really solid relic, giving most Bladed Cog characters a 3+ invulnerable save (when the Creed bonus is applied). Only the Patriarch gets a 4+ invulnerable save, but a nice bonus for it anyway. Very good for keeping other characters alive for longer or in combat. Metallophagic Stave- Rusted Claw Magus only. A Force Stave that is +2S, AP-5, D3 damage. Each time you roll a wound roll of 4+ for an attack that targets a vehicle, it suffers 1 mortal wound in addition to normal damage. If you roll a wound roll of 6+, it suffers D3 mortal wounds. This gives the Magus a huge AP bonus on his Force stave, making it a useful weapon against most units he may face. However, the Magus is not the best melee character for the army, hitting on a 3+ with only 3 attacks. This puts him at S5, so he is still wounding most vehicles on a 5+, but a good chance of doing additional mortal wounds. Not a bad relic, but not one I would see being taken most often. Reliquary of Saint Tenndarc- Pauper Princes models only. Friendly Pauper Princes units automatically pass morale tests when within 6" of the bearer. In addition, roll a D6 each time a friendly Pauper Princes Infantry or Bike unit is destroyed when within 6" of the bearer. On a 4+, that model can either shoot one of its ranged weapons as if it were the shooting phase, or make a single attack with a melee weapon as if it were the Fight phase. A nice bonus for the army, giving you another way to get an immunity to morale bubble in the force. The ability to fire back or fight back with nearby fallen models is also a nice boost, giving you a chance to do more damage on enemy units. Elixir of the Prime Specimen- Twisted Helix model only. 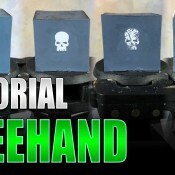 Increase the attacks, toughness and wounds characteristics of the bearer by 1. Along with the strength bonus for the Creed, this is a solid Relic for really boosting the durability of your warlord. 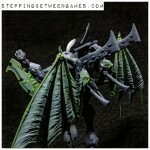 This is strong on a Patriarch or Abominant to make them even more powerful in combat. Overall, there are some solid relics to choose from. I think the Mark of the Clawed Omnissiah is probably the strongest, but is limited to only Bladed Cog models. I think my choices would be Sword of the Four-Armed Emperor and The Gift From Beyond. Amulet of the Voidwyrm is also a solid Relic, as the ability to block enemy overwatch can be pretty powerful in the right circumstances. The Genestealer Cults had three very strong psychic powers in the Index, are the four new powers as useful for the army? One big bonus is that the two casters, the Magus and Patriarch, each know two powers from the Discipline, rather than just the one. Mass Hypnosis- Warp charge value 7. Select a visible enemy unit within 18". The unit cannot fire Overwatch, fights last in the Fight phase and must subtract 1 from its hit rolls till the start of your next psychic phase. This is a solid psychic power. The ability to shut down an opponent's overwatch, make them fight last and give them -1 to hit with a single power is very strong. Great for units that are strong in the shooting phase or fight phase. The range is also great, giving the Magus the ability to threaten units from afar. Mind Control- Warp charge value 7. If manifested, select an enemy model within 12" and roll 3D6. If the score is equal to or more than the model's Leadership, that model can immediately shoot another enemy unit of your choice, or make a single close combat attack against it. Models cannot attack themselves, but can attack other members of their unit. Another solid power. Obviously better on larger models, such as vehicles or an Imperial Knight. This has the ability to do a lot of damage to the enemy army if there is a suitable target of the power. Psionic Blast- Warp charge value 5. If manifested, select a visible enemy unit within 18" and roll 2D6. If the result is less than the highest Leadership characteristic, it suffers one mortal wound. Otherwise it suffers D3 mortal wounds. This is like an extra Smite attack for the character. You will do at least 1 mortal wound with this power, with the option to do D3 if you can roll high enough. This targets any enemy unit within range, so can be used to snipe characters on a single wound. Mental Onslaught- Warp Charge value 6. If manifested, select a visible enemy model within 18". Both players roll a D6 and add their Leadership value. If you score higher, the enemy model suffers 1 mortal wound. If the enemy model is still alive, repeat the process until the model is slain, or you fail to score higher than your opponent. This is a strong power on a Patriarch, so is Leadership 10. This means you have a good chance of doing serious damage to an enemy model if you can roll high enough. There is no limit on the number of wounds you can cause, so this has the potential to seriously harm an enemy vehicle if they have a lower leadership. Also works well if you can lower the enemy Leadership value, of which there are several ways to do so in the codex. Psychic Stimulus- Warp Charge value 6. 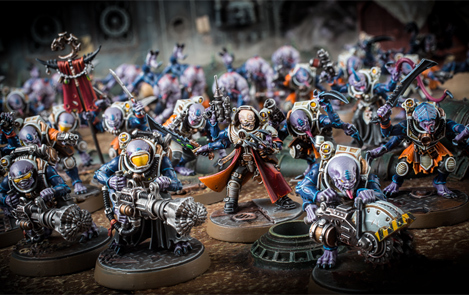 Select a friendly Genestealer Cults unit within 18" of the psyker. Until the start of the next psychic phase, the unit can charge, even if it Advanced, and always fights first in the Fight phase (if your opponent's unit charged or has a similar ability, alternate which units fight). A decent psychic power for the army. The always attack first abilities are odd for me. If you are charging after advancing, you are striking first. If your opponent charges you, they are striking first. It only really works for extended combats. This is a solid power, but not one I'm sure I would take often. Might From Beyond- Warp charge value 7. A friendly Genestealer Cults Infantry or Biker unit within 18" adds 1 to their strength and attacks characteristics until the start of your next psychic phase. I think this is one of the strongest psychic powers in the discipline for me. Combined with the strong combat abilities of many Genestealer Cults units, this is a very powerful ability to have. Overall, I still think Mass Hypnosis and Might From Beyond are the strongest powers available to the Cult. Mental Onslaught has the potential to do a lot of damage if you can keep rolling well for the roll offs. Psionic Blast gives you the ability to do automatic mortal wounds on an enemy unit, which is a nice bonus. The Cult has got some nice bonuses from the codex in the form of warlord traits, relics and additional psychic powers. They have some solid options to choose from and I look forward to trying some of them out in my games. I'm liking the Smite and Psionic Blast Magi combo, have a couple of these dealing Mortal Wounds will be fun. 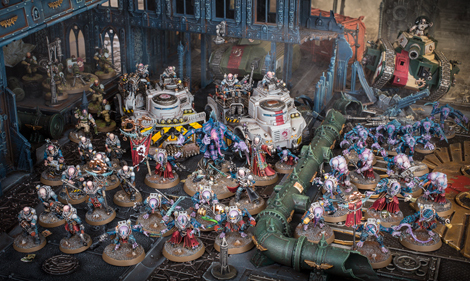 The Cult of the Four Armed Emperor is looking like my favourite, love the SwordotFAE and the Inscrutable Cunning for extra CPs which you can spend on getting extra Relics or Cult Ambush shenanigans. Yeah, 8 attacks on the Primus is not too shabby. Useful for getting through hordes, especially if you can boost his strength. I think Inscrutable cunning is going to work well in combination with the Broodcoven stratagem. Give the Patriarch and Magus a couple of useful warlord traits and give a Magus Inscrutable Cunning. At the worst, the Broodcoven stratagem is essentially free, at best you get two more CP and a free re-roll. On the Crouchling: You don't actually get rid of the Familiars when you use your extra cast. It's just that you can only do it once per Game. It's one of the standout Relics to me, given how many strong Powers there are in the Broodmind Discipline, and how many of them are WC6-7. Always Strike First abilities work better either when you have a bunch of them, or when your Army is taking multiple Charges at once. In the latter case, it forces your Opponent's hand when it comes to picking their first Unit to fight. If they don't go for the Unit that has Psionic Stimulus up first (or if they go for it and whiff), they're essentially giving you 2CP for a free Counter-Offensive Stratagem. If they do, they're giving you the opportunity to use Counter-Offensive somewhere else, on something untouched. Ah, I didn't realise the familiars stayed in play. That makes things a bit different in that case. Much more useful in that context. I'm pretty sure it was in a FAQ that invulnerable saves are never modified unless specifically stated, so the Amulet would only affect the normal armour save. Cheers, I must have missed that one.